We highly recommend the use of speed ramp and warning signage in conjunction with traffic flow plates. These low cost high quality items are virtually maintenance free and will pay dividends after a long trouble-free service. 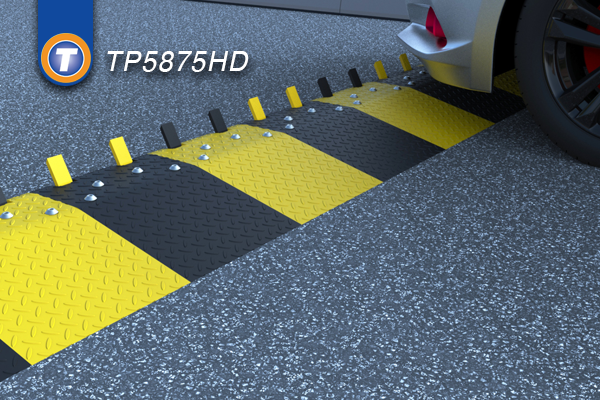 These speed ramps and flow plates are a highly recommended way to help traffic control. The design offers early visual warning and provides a highly effective method of restricting speed. The speed ramp is available in two heights, consequently applying a set speed restriction, with the 50mm version reducing vehicles to speeds of 15-20mph. The 75mm version to speeds of 5-10mph. 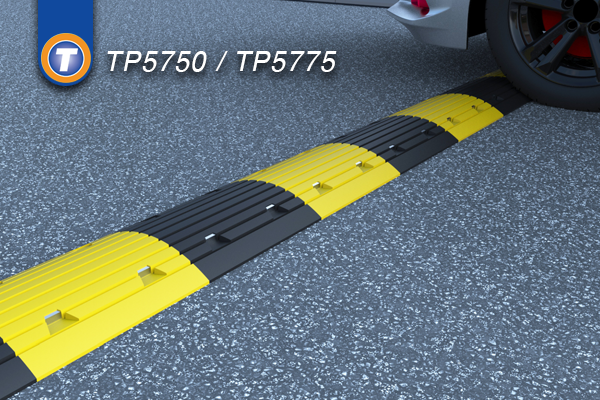 The TP5750 can be laid in multiple lengths by simply interlocking each of the 500mm wide sections securely with four fixing bolts for extra stability. The 75mm option also includes a centre run cable for temporary traffic lights, fair grounds, water supplies etc. It is recommended that signage is used in conjunction with speed ramps to warn oncoming traffic. The Sunken Flow Plate incorporates an inbuilt counterbalance action, ensuring that the plate returns to the upright position after a vehicle has passed over it. Constructed from heavy steel, the flow control plate is designed to encourage a mono-directional flow of traffic, as well as preventing vehicles from entering if they are travelling from the opposing direction. The sunken flow plate is suitable for installations where a substantial foundation is not present. Optional models suitable for both light (max 7.5 tonne) and heavy goods vehicles (max 40 ton). We highly recommend the use of speed ramp and warning signage in conjunction with flow plates. The Surface Mounted Flow Plate incorporates an inbuilt counterbalance action, ensuring that the plate returns to the upright position after a vehicle has passed over it. Constructed from heavy steel, the flow control plate is designed to encourage a mono-directional flow of traffic, as well as preventing vehicles from entering if they are travelling from the opposing direction. 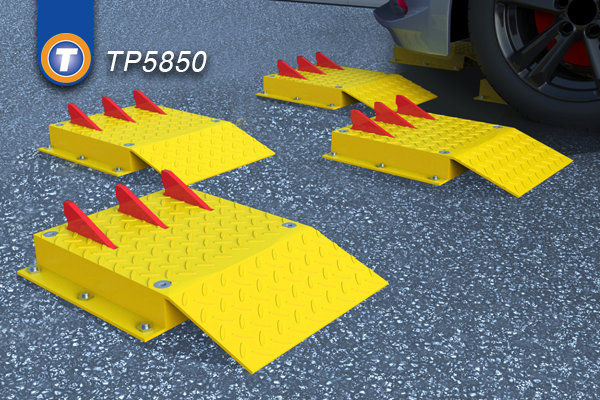 The surface mounted traffic flow control plates are bolted down to existing road surfaces where a substantial foundation/surface is already in place. No excavation of the road surface is required. Optional models suitable for both light (max 7.5 ton) and heavy goods vehicles (max 40 ton). We highly recommend the use of speed ramp and warning signage in conjunction with flow plates. A sophisticated inbuilt heavy duty sprung action ensures that the TP5875HD returns to the upright position after a vehicle has passed over it. Constructed from heavy steel, the flow control plate is designed to encourage a mono-directional flow of traffic, as well as deterring vehicles from entering if they are travelling from the opposing direction. 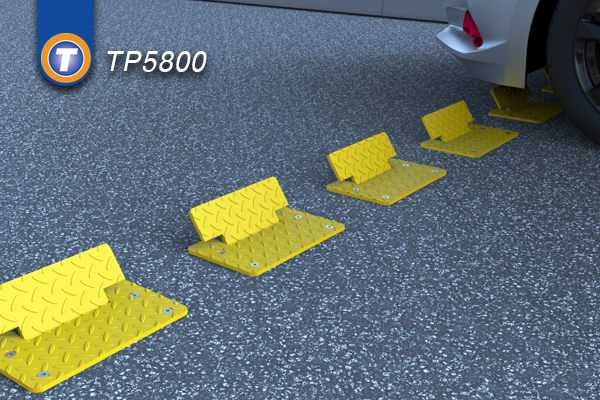 Designed to accommodate cars and heavy goods vehicles, as their design lends itself to being durable and a heavier duty solution to one way traffic control. We highly recommend the use of speed ramp and warning signage in conjunction with flow plates.